Whatever George Osborne may say on Wednesday in his budget speech, he cannot extricate himself from the wreckage that now surrounds him. He may be just about the last person in Britain to believe that austerity offers a credible path to recovery from recession – and it may be doubted that even he remains a true believer. The repeated fall back into recession, a government deficit that goes on rising, and the loss of the country’s top credit rating are surely enough to shake the confidence of even the most arrogant and obtuse practitioner of the dismal science. The Chancellor’s continued commitment to austerity has made a significant personal contribution to the digging of an economic hole from which there now seems no discernible path to recovery. Perhaps his only saving grace is that he should not be left to bear the burden of that responsibility alone. As a long-time critic of British economic policy under successive governments, I hear the flapping wings of chickens coming home to roost; for the truth is that the current difficulties – and the imminent prospect of long-term economic decline – are the inevitable consequences of decades of mistaken policy choices and the worship of false gods. It is hard to grasp, even now, just how thoroughly and comprehensively the favoured nostrums of the last four decades – those nostrums that have guided our fortunes over the whole of that period – have now been disproved and discredited. Let us look at some of them in turn. Take the propositions that the market (and especially financial markets) can be accurately predicted on the basis of mathematical models, that they are self-correcting and do not therefore need regulation, and that any intervention in unregulated markets will automatically produce results that will be worse than if they had been left alone. As Keynes warned, and experience in the form of the global financial crisis has confirmed, markets – and financial markets in particular – are all too likely, if unregulated, to lead to excess and collapse. Or, what about the belief – maintained for more than three decades – that macro-economic policy is not a matter for government but is a simple matter of restraining inflation – an essentially technical task through setting interest rates that can safely be entrusted to unaccountable bankers? Do we still believe that monetary policy is all that is needed for a healthy economy? Or that it is any more effective than pushing on a piece of string as a means of escaping from recession? Or – when we look to more successful economies overseas – that there is no role for government? And what about the related confidence displayed in the expertise and objectivity of bankers in running our economy? Do we still believe that bankers have the common interest at heart and do not make decisions to suit themselves? Are we happy that they continue to enjoy the astonishing privilege, as private monopolies, of creating money out of nothing, thereby exercising hugely more power over our fortunes than do elected governments? What do we think of the faith placed by successive governments, not least by New Labour, in the financial services industry as the means of paying our way in the world? Do we still accept that the huge fortunes made by a few in a largely unregulated City represented real and sustainable wealth-creation in which the rest of us would share? Even more importantly, what do we think of the careless assumption that focusing on financial services made it unnecessary to concern ourselves with our manufacturing base? Do we now understand that the loss of manufacturing means – now that the chips are down – that we are denied the most reliable way of maintaining our standard of living, the most important source of innovation, the most substantial creator of new jobs, the most effective stimulus to improved productivity and the provider of the quickest return on investment? Do we understand that globalisation has meant, with the removal of exchange controls, that major global investors can now move huge volumes of money – totalling as much in a single day as the total annual production of most economies – from one country to another, and have thereby disabled democratic governments from doing anything to protect us? And do we understand that the combined effect of all these policies has been to create a huge mechanism for shifting wealth and resource from the poor to the rich, and that it is that which is responsible, rather than any great ability or virtue on the part of the rich, for the widening inequality that weakens and disfigures our society? Underpinning all of this is a fundamental failure – an obstinate refusal to recognise that the world has changed and that, with the rise of newly efficient economies around the globe, we have no innate right to have a privileged standard of living delivered to us on a plate. The fact is that the UK has been a fundamentally uncompetitive economy ever since the 1970s, but we have preferred to avert our gaze from this uncomfortable truth. The issue of competitiveness is not recognised, let alone discussed in Britain; yet much more successful economies use measures of competitiveness as their guide to what is required from macro-economic policy. We, on the other hand, have preferred to take refuge in a range of nostrums that we can now see have little merit. George Osborne’s budget will be scrutinised for signals that tiny changes in direction might be forthcoming and that salvation might lie therein. But the budget will be a minor factor in an economic dilemma which George Osborne – and his predecessors – have spent painstaking decades in creating. 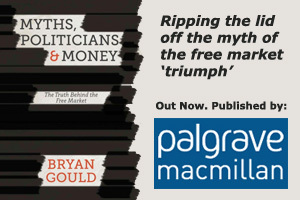 Bryan Gould’s new book Myths, Politicians, and Money will be published by Palgrave Macmillan later this year. This article was published in the online Guardian on 18 March.